Influenza claims the lives of up to 500,000 people each year. With the looming threat of a pandemic in any given year, government agencies and disease prevention organizations are devoted to gaining control of the situation. Surveillance measures, pandemic preparedness, vaccine production, and antiviral control are paramount. Sufficient laboratory capacity and the benefits conferred by rapid testing in a pandemic situation are also crucial components. The next five years will continue to yield support and funding for many R&D programs and pandemic prevention and/or control by worldwide governments, organizations, and health professionals. In a new analysis, BCC Research examines three product segments for influenza: vaccines, therapeutics, and diagnostics. The diagnostics segment includes conventional laboratory products and the high-growth sector of rapid testing products. According to BCC Research’s predictions, the global influenza market will exceed $6.4 billion by 2021, increasing at a compound annual growth rate (CAGR) of 3.6% over the forecast period. BCC Research estimates that in 2016, the global influenza market reached $5.4 billion, including vaccines, therapeutics, and diagnostic products. The therapeutics and vaccines segments have experienced the largest increases in revenues, with therapeutics generating $989 million in 2016 and vaccines $3.9 billion. Sales for diagnostics increased to $485 million in 2016. Revenue growth for vaccines and therapeutics is expected to continue, and these segments will generate combined sales of $5.8 billion by 2021. Growth will be supported by a growing population, resulting in additional products needed for the prevention and treatment of influenza; continued government stockpiling in certain areas; new technologies in influenza vaccines and therapeutics; and educational efforts to promote prophylactic use of influenza products. Despite increased awareness and the necessity of diagnostic products for the time-sensitive treatment of influenza, diagnostics have shown steady growth of only 2%–4% annually. A stagnant conventional laboratory diagnostic market is offset by the growing demand for rapid testing products. BCC Research projects that a strong demand for diagnostics will propel sales to $635 million by 2021, at a CAGR of 5.5%. All three segments of the global influenza market are significantly affected by seasonal factors and will be vulnerable to weak flu seasons. 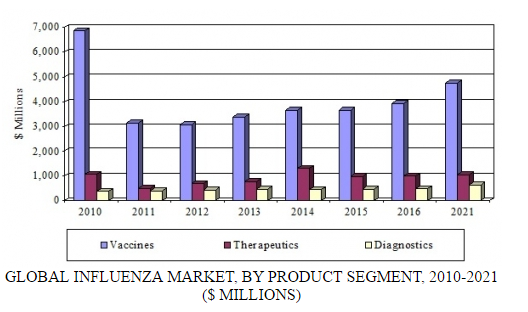 However, increased efforts in education on preventing influenza through vaccine use will be beneficial to vaccine product developers and marketers. Several significant trends continue to influence the global influenza market. These include H1N1 outbreaks, avian flu surveillance, antiviral resistance, recreated viruses, cell-based and recombinant products, epidemic/pandemic preparedness, immaterialized market risk, and world influenza impact (seasonal and pandemic). How to deal with genetic information rather than physical samples of pandemic influenza virus is an active topic of discussion for the World Health Organization (WHO). Currently, only physical samples are part of a framework of access and benefit sharing set up and run by the WHO. The Pandemic Influenza Preparedness (PIP) Framework Advisory Group is meeting March 28–31, with a separate session on March 30 for the WHO Global Influenza Surveillance and Response System (GISRS). GISRS is an international network of influenza laboratories conducting year-round surveillance of influenza viruses. It serves as a global alert mechanism for the emergence of influenza viruses with pandemic potential (WHO). According to a meeting document (seen and reported by Intellectual Property Watch), called “Development of guidance on the sharing of influenza viruses with pandemic potential, genetic sequence data and information under the PIP Framework,” the PIP Advisory Group has been tasked with addressing concerns regarding a decrease in the number of influenza viruses with human pandemic potential shared with GISRS since 2013. BCC Research’s report, The Global Influenza Market, thoroughly evaluates the market for influenza vaccines, therapeutics, and diagnostics. It provides an overview of currently marketed products with a detailed analysis of market positions and competitive environments. The study also includes information about products in development. Market dynamics are analyzed, specifically growth drivers, restraints, and opportunities. The geographic scope of the analysis is worldwide, with an emphasis on US and European markets. Global market trends, with projections of CAGRs through 2021, are provided.